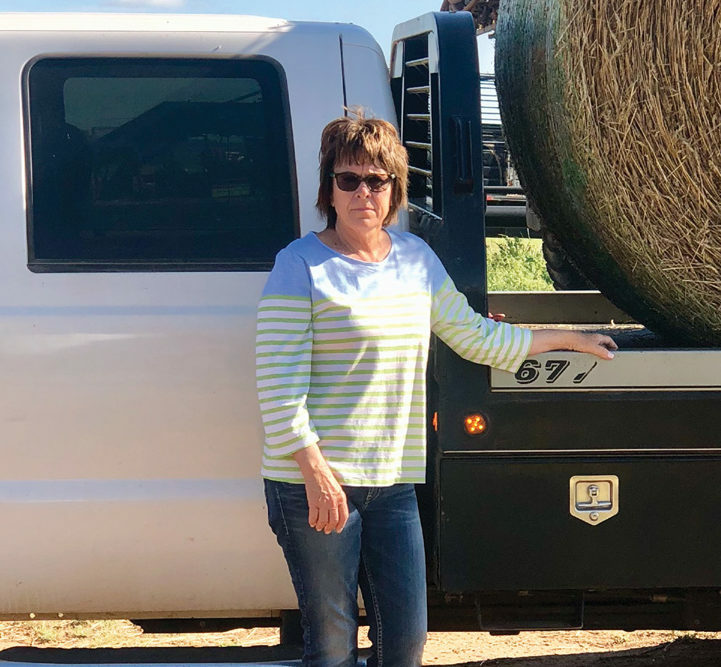 Jill DeRusha of Willow is being recognized as a significant woman in Oklahoma agriculture. Jill DeRusha wears her hands-on love for agriculture with pride. Before the sun has snuck a peek at the new day in southwestern Oklahoma, the 60-year-old who lives northwest of Mangum in the Jester/Willow Community, is out at the barn feeding. Depending on the day, she’s checking to see if heifers are calving. She’s checking water on the places with no ponds. She’s running after parts for the machinery. She’s making sure everyone has lunch and that the paperwork is filled out for the Farm Service Agency office. She’s checking on markets for cattle and crops, and selling crops “when appropriate.” She’s feeding hay to cattle and, when time permits, she’s mowing the yard. So by the end of the day, DeRusha is always wearing her love for ag not only in her heart, but on her button down shirt and blue jeans. “On any given day, I can have manure, hay, dirt and grease on me somewhere,” DeRusha said. She and husband Randy raise cattle, cotton, wheat, alfalfa and some milo. They’ve had roughly 2,000 acres of cotton in recent years. They also have 350 mama cows. They own some acres and lease the rest. When DeRusha says she checks on her cattle, that doesn’t mean she’s simply counting them. She knows her mama cows – and the reason for that dates back more than 50 years. DeRusha firmly believes agriculture has shaped her entire life. The well-known drought in the 1950s ended the year Jill DeRusha was born, 1957. However, Jill and Randy found themselves right in the middle of the historic drought that sank its teeth into Oklahoma less than a decade ago. It was a lesson of life, of carrying on, to pass along to family, regardless of their professions. Between them, they have five children. Her daughter Jaclyn and son-in-law Trey Christensen live in Oklahoma City, daughter Kelsey and son-in-law Kelby Merz live in Elk City, and son Kolby Miller and daughter-in-law McKenzie live in Oklahoma City. TaShina DeRusha lives in Somerville, Tenn., and Jared DeRusha lives in Dallas. Jill and Randy have six grandchildren. DeRusha’s parents, Jimmy and the late Joyce (Wheeler) Heatly, were partners in the family farming and ranching operation which included a cow-calf operation, cotton, wheat and hay. The first tractor DeRusha drove was a Massey Ferguson 65. She was in second grade. Through 4-H and FFA their family traveled near and far showing cattle. She finished in the top 10 in the “Ag college.” That college experience only deepened her love for agriculture and she went on to work in the OSU Extension Service at the county level as an Ag Agent. She was a pacesetter in that regard. She uses that knowledge and experience daily in their ag operation. Paul Harvey’s “So God Made a Farmer” includes a heartfelt description of just some of what is required of a farmer and rancher. “I love Paul Harvey’s poem, ‘So God Made a Farmer,’ and it is on our wall,” DeRusha said. Why does she love it? Because she believes that in agriculture you not only have to be determined, you have to be flexible. So whether it’s mud, manure or grease that she has on her shirt and jeans at the end of the day, DeRusha will be found wearing every bit of it with pride.